The Department of Defense has identified three of the four Americans who died on Wednesday, January 16, 2019 in Manbji, Syria in a suicide bombing. The patrol was on an engagement patrol when the attack occurred. A suicide bomber detonated his explosive vest killing one Special Forces Warrant Officer, a Navy Sailor, and a DoD civilian. A DoD contractor also died in the attack. The contractor was a naturalized U.S. citizen who was working as a contract interpreter. Three other U.S. servicemembers were wounded. Approximately nine Syrians were also killed and others wounded. Members of the Manbij Military Council (MMC) were also among the 16 people who were killed. The MMC has controlled the city since it was liberated from ISIS. Chief Warrant Officer 2 Jonathan Farmer was a member of 3rd Battalion, 5th Special Forces Group. 5th SFGA has been rotating units into Syria to conduct operations and training with the Syrian Democratic Front. Shannon Kent was a Navy Chief Cryptologic Technician based at Fort George Meade, Maryland. She was assigned to the Cryptologic Warfare Activity 66 (CWA 66). Chief Petty Officer Kent hailed from upstate New York and enlisted in the Navy in 2003. Shannon was a wife and mother to two young boys. She had deployed multiple times, was a cancer survivor, and was to start a graduate program this year. Read more about Shannon Kent in “Navy Identifies Sailor Killed in Manbij, Syria”, Navy.mil, January 18, 2019. The DoD Civilian was Scott Wirtz. He was assigned to the Defense Intelligence Agency as an operations support specialist. He was a former Navy SEAL. Wirtz, age 42, was a native of St. Louis. He had been assigned as an operations support specialist (HUMINT) since February 2017 and had served on multiple deployments. 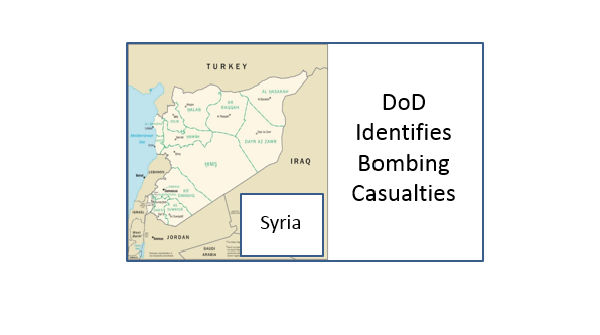 Read more about Scott in “Defense Intelligence Agency civilian killed in Syria identified”, Defense Intelligence Agency, January 18, 2019. The Arabic interpreter was from East Point, Georgia. Ghadir Taher, age 27, immigrated with her family from Syria. She was employed by Valiant Integrated Services, a defense contractor. She was born and raised in Damascus and became an American citizen in 2001. She had studied international business at Georgia State University before going to work for Valiant. Read more in “East Point woman among 19 killed in suicide bombing in Syria”, Atlanta Journal-Constitution, January 18, 2019. Edits: Additional information has been added to this article as it has come available. January 21, 2019. “Parents of slain Navy SEAL finding comfort reading old emails”, KPLR 11.com. January 18, 2019, “Green Beret, Navy linguist, SEAL-turned-DIA civilian among Americans killed in ISIS-claimed bombing in Syria”, Stars and Stripes. January 18, 2019, Statement by Valiant Integrated Services. January 16, 2019, “Explosion Kills Four in Manbij”, CENTCOM.